The OptiFlo cartridge collector system is a completely modular design that allows an unlimited range of sizes. The compact modules help conserve valuable space, and can be interconnected to accommodate the largest air cleaning task. OptiFlo units have the lowest flange-to-flange pressure drop, allowing up to 10% greater airflow with lower fan horsepower than competitive models. 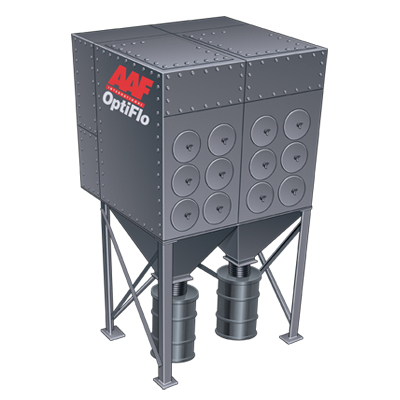 The OptiFlo’s aerodynamic design permits free-fall of dislodged particulate into the hopper without direct impingement of contaminant on the cartridges, minimizing abrasion and dust build-up. A wide selection of cartridge types, options, and accessories enable the collector to be tailored to specific application requirements. Choose from top or front inlet and side or bottom outlet arrangements. See the Product Brochure or click on one of the OptiFlo models below for more information. 10’8″ model with 4 cartridges. 11’8″ model with 8 cartridges. 11’8″ model with 16 cartridges. 11’8″ model with 24 cartridges. 11’8″ model with 32 cartridges. 11’8″ model with 40 cartridges. 12’ 2½” high model with 6 cartridges. 13’ 2½” high model with 12 cartridges. 13’ 2½” high model with 24 cartridges. 13’ 2½” high model with 36 cartridges. 13’ 2½” high model with 48 cartridges. 13’ 2½” high model with 60 cartridges. 13’ 2½” high model with 72 cartridges. 14’9” high model with 16 cartridges. 14’9” high model with 32 cartridges. 14’9” high model with 48 cartridges. 14’9” high model with 64 cartridges. 14’9” high model with 80 cartridges. 14’9” high model with 96 cartridges. 14’9” high model with 112 cartridges. 14’9” high model with 128 cartridges.